Last winter was the first year that I went snowboarding on our family vacation in Austria. I have been on winter sport vacations when I was younger, but back then I skied. I did not come very far last year and it was more falling than boarding to be honest. Since we are going again this year my mother advised me to take some lessons here in the Netherlands beforehand so I could actually enjoy it a bit more when we are in Austria. So a couple of weeks ago I started to take some snowboard lessons. Only not on actual snow, but indoors on a carpet. You basically are on a moving carpet of 5 meters wide and 10 meters long. I know that this must sound pretty Aladdin like haha. 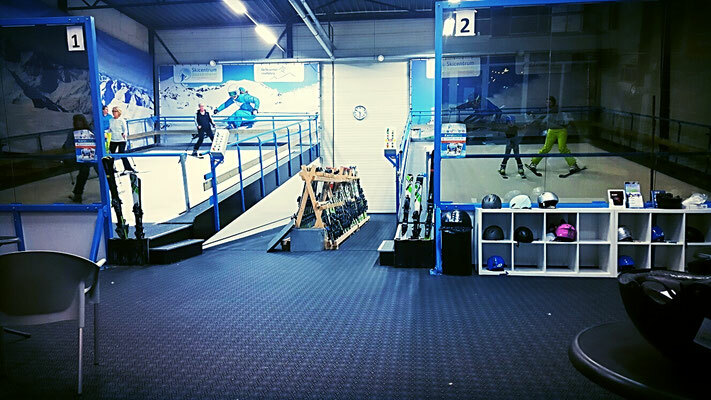 The carpet starts rolling upwards so you have the same sensation as if you are actually snowboarding. There is a mirror in front of you and the advice is that you don't look at the carpet as this could make you dizzy. Also in the mirror you can see your posture and correct it faster. The advantage of lesson on a carpet is that your teacher can stop the carpet when he sees you are about to fall. Also you don't have to take a lift to get back at the top so you don't lose any lesson time. The downside is that it is very difficult because if you make a mistake you cannot correct it as you could have in the snow. The carpet will eat you alive. But the upside of the difficulty is that if you are able to snowboard on the carpet, you will definitely be able to do it in the snow. It will be easier then. The lessons are 30 minutes split into 10 minutes at a time because of the high intensity. After you have had 10 minutes of training, another person gets 10 minutes, and thereafter you get 10 minutes again. This goes on until you have had 30 minutes on the carpet. Yesterday I had a snowboard lesson and I took a picture of the carpet so you can see what I’m talking about.